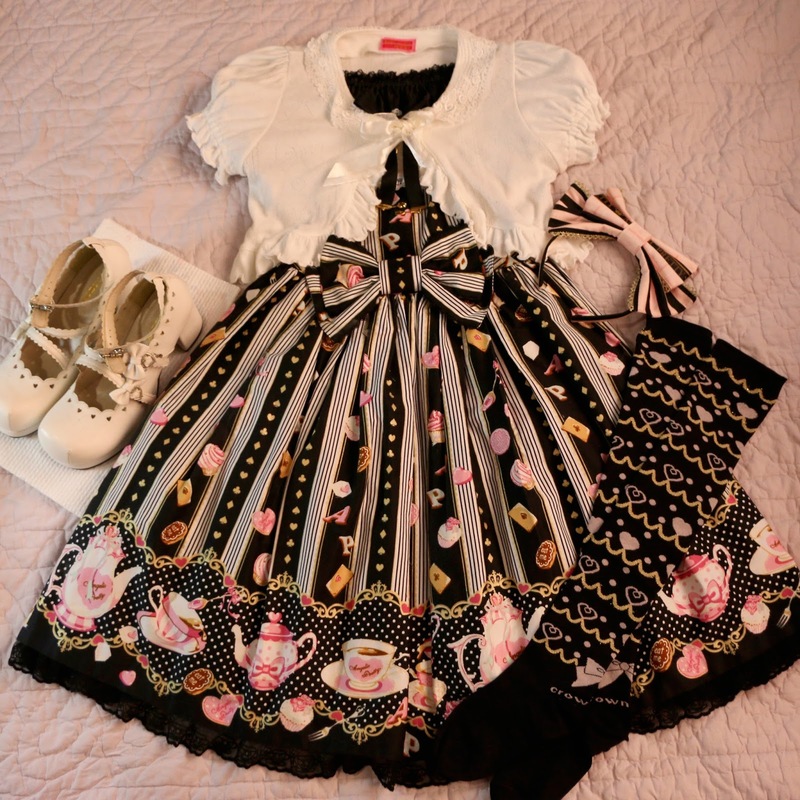 You know me, I can't buy a new main piece and not do some flat-lays so here are some outfits with my super adorable new Wonder Party OP! I just love this print. 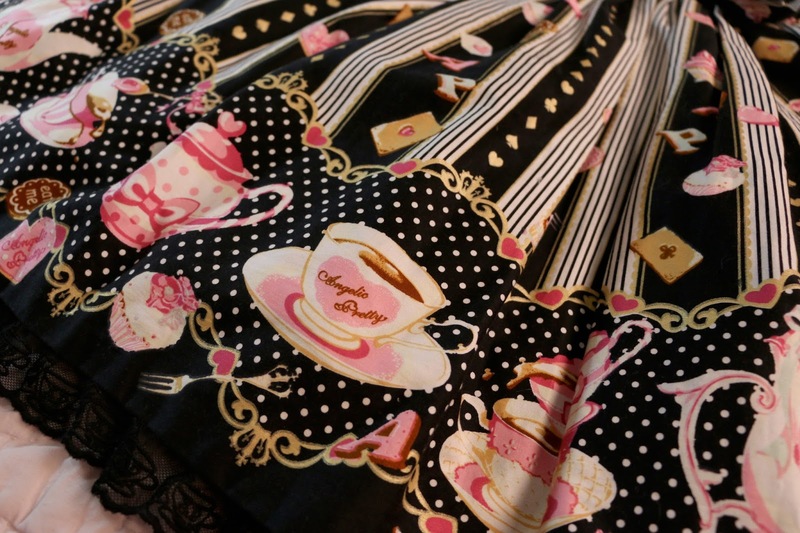 Black with pink, adorable food and tea set print, stripes...it's so many things I love. I keep finding beautiful details every time I look at it, and am super exited to wear it out. First up I wanted to pair it with my new Baby, the Stars Shine Bright bolero that I got in the same auctions haul. I also wanted to wear my white shoes (which I appropriated out of our model wardrobe) so I felt I needed to wear black socks and then the AP headbow also seemed like a good match. I really like this outfit, even if the colour balance is not what I normally do...when is the last time I ran with pale shoes and dark legwear? This outfit also made me realise how much more brand I have in my wardrobe these days. I'm never going to be brand-only, because I buy what I like regardless of source, so I find it kind of amusing that I can do almost solid brand outfits sometimes. For the last outfit I wanted to really run with lots of pink! 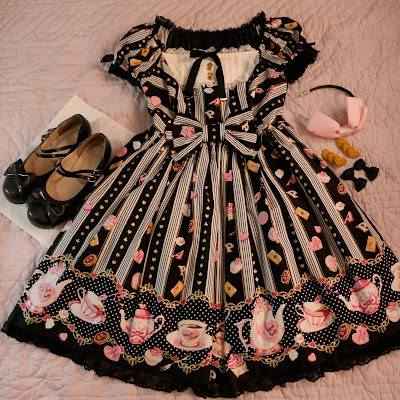 Once again I kind of don't have much to say, except that I like this outfit and also would enjoy wearing it. Wonder Party is such a classic and iconic print by now. I wanted it myself for a while before realizing that I liked it, but not loved it, so would never pay more than Y10k for it - and with the limited storage I have, I'd rather buy prints I like more. They're all really great coords, although I think I'm ever so slightly more partial towards the middle one. I find OP's quite limiting to coordinate, not all of them look good with a blouse underneath when worn and not all cardigan/bolero cuts will work, depending on the bodice cut. I guess the same goes for some JSK cuts, but somehow OP's still seem more challenging for me. You've done great with this one, they're all such wearable outfits and work really well together. Haha I wouldn't pay more than that either (Y9K was what I paid)...though what's terrible is now I kinda want to get the brown colourway in a different cut! Thank you, glad you like them! 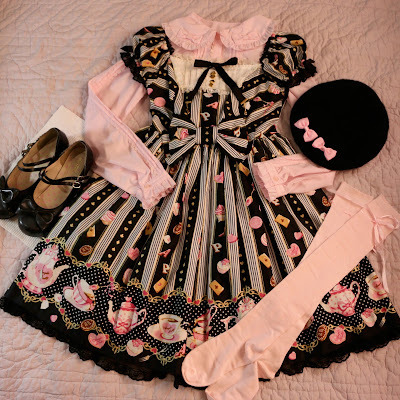 OPs are definitely challenging, and to be honest I'd probably be most likely to wear the second coord IRL.